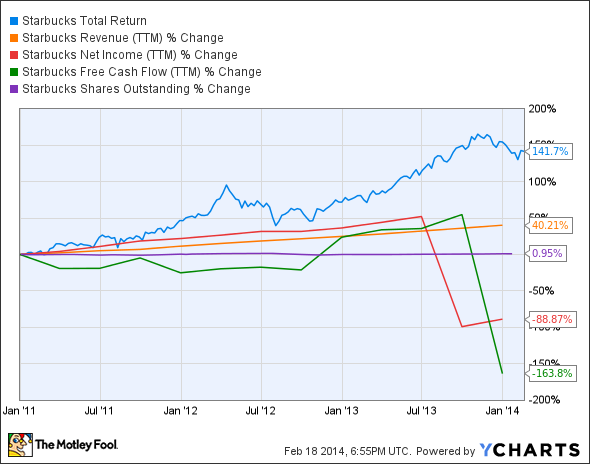 Is Starbucks Corporation Destined for Greatness? The world's largest coffee chain hasn't let a multibillion-dollar loss slow it down. 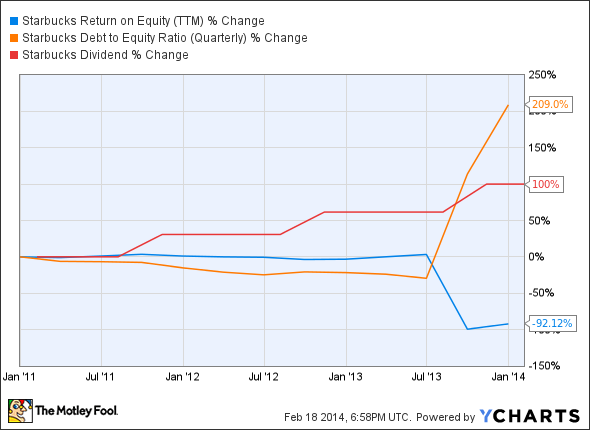 How will Starbucks (SBUX) fare in 2014? Investors love stocks that consistently beat the Street without getting ahead of their fundamentals and risking a meltdown. The best stocks offer sustainable market-beating gains, with robust and improving financial metrics that support strong price growth. Does Starbucks Corporation (NASDAQ:SBUX) fit the bill? Let's look at what its recent results tell us about its potential for future gains. Things don't look good for Starbucks today, as it's only earned two out of nine possible passing grades. It's important to note that many of these downtrends are the result of a multibillion-dollar fine owed to Mondelez (NASDAQ:MDLZ) for prematurely terminating a distribution contract. Without that impact, it's likely that Starbucks would have picked up at least one or two more passing grades. Let's not give Starbucks a free pass just yet, though -- we want to find out of the global coffee purveyor can earn a respectable score next year after the impact of that settlement are pushed into the past. Let's dig deeper to find out if it can. Starbucks' latest earnings report showed strong top and bottom line growth, with revenue and earnings per share up 12% and 25% respectively. The company continues to drive amazing foot traffic for such a well-established franchise, as it enjoyed a 5% uptick in comparable-store sales and a 4% increase in overall store traffic. Starbucks maintains ambitious plans to expand its footprint in the Asia-Pacific region with 750 new stores planned in 2014, which would increase Starbucks' global footprints by nearly 15%. The company recently opened its first store in Brunei, which is the 64th country in which Starbucks now has a presence. CEO Howard Schultz has noted that much of Starbucks' traditional store traffic is being lost to those shopping online at StarbucksStore.com, which winds up benefiting the company just the same. Fool contributor Rich Duprey notes that Starbucks' $100 million acquisition of San Francisco-based La Boulange is likely to produce an overhauled lineup of baked goods at more than 3,500 stores. Fool contributor Andrew Marder notes that Starbucks could generate higher margins by charging more for its "short" drinks, and through cross-selling high-end bagged coffees for home consumption. The company recently introduced a new line of instant espresso drinks, which is expected to attract consumers looking for branded instant coffee at home. Starbucks' enhanced digital presence, with a mobile-payment platform and customer loyalty programs, could also help it to drive online sales while simultaneously encouraging consistent foot traffic. Fool contributor Kyle Colona notes that the company continues to reap benefits from its strategic alliance with Green Mountain Coffee Roasters (UNKNOWN:GMCR.DL), which serves up K-Cups of Starbucks coffee in the latter's Keurig single-serve brewing system. According to the National Coffee Association, 12% of U.S. households now own single -serve brewers. That's both an impressive growth story and an indication of a long growth runway ahead -- Starbucks own Verismo single-serve brewer could capture some of this growing market by appealing to those who prefer lattes over the traditional cup of joe. However, Green Mountain has no particular loyalty to Starbucks -- it's also promoting a line of K-Cups from rival Dunkin' Brands (NASDAQ:DNKN). This might not hurt any of the three parties, as the single-serve coffee market is growing nine times faster than rest of the coffee industry, offering plenty of opportunity for new sales. Today, Starbucks has some of the qualities that make up a great stock, but no stock is truly perfect. Digging deeper can help you uncover the answers you need to make a great buy -- or to stay away from a stock that's going nowhere.